A bright and crunchy red apple marketed as “the juiciest”, with tropical and spicy tasting notes reminiscent of aniseed, has been unveiled at Fruit Attraction in Madrid. Developed by Belgian breeder Better3Fruit, the Kizuri cultivar will be marketed under a new brand, Morgana, and produced in Belgium, Germany, Italy and the Netherlands by four partners – BFV, Krings Obstbau Vertriebs, Melinda and Fruitveiling Zuid Limburg Margraeten (MAG). 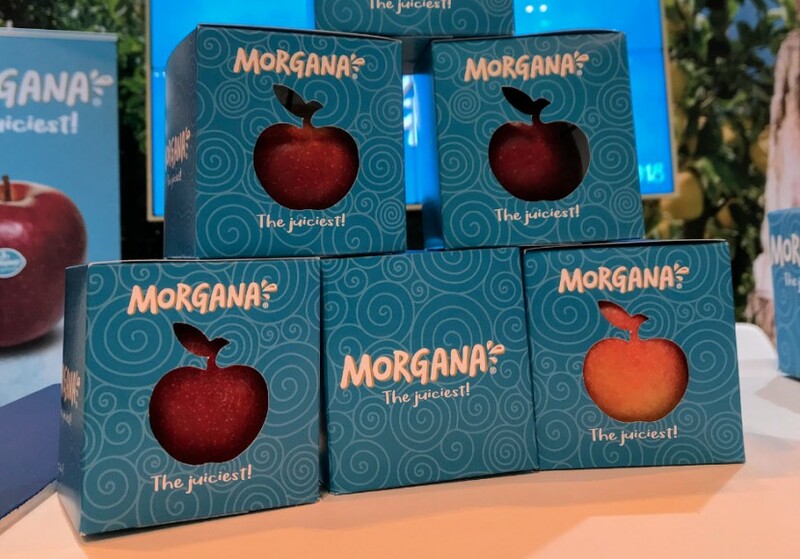 The four companies involved have formed the Morgana Apple Group to develop the new apple variety commercially, having also signed an exclusive agreement with licence-holder ABCz to sell it in Europe. The chosen brand name is apparently linked to the apple’s organoleptic characteristics and refers for example to Fata Morgana, a kind of mirage, to underline the fruit’s juiciness and freshness. Morgana also recalls the goddess of Arthurian legend, a branding strategy designed to boost the apple’s perceived value by giving it a magical, fantastic aura. “Morgana is a classy, sophisticated, high-quality apple, mainly dedicated to a target of consumers between 20 and 50 years [old], particularly oriented towards premium quality products,” the group added. By the end of 2019, the partners expect to have planted 600,000 trees in Europe, enabling them to capture significant market share from 2021 onwards.